Historic photo of the day: I want to be in America! 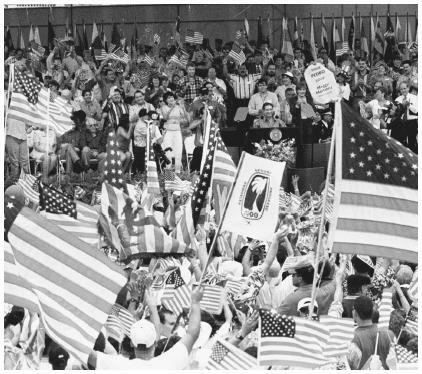 On July 4, 1998, the PNP Party staged a huge event, celebrating the US invasion of Puerto Rico in1898. The US flags were everywhere. Puerto Rican flags were nowhere to be seen, as the crowds whistled and stomped and cheered. The PNP loved the US so much, that they wanted Puerto Rico to become the 51st state. Eighteen years later, Puerto Rico is still a colony – a profitable one for Walmart, Walgreens, Ford Motors, McDonald’s, and John Paulson. There is no statehood in sight. A Financial Control Board is about to arrive from Washington and Wall Street. Reminds me of “I Wanna Live in America” …. from West Side Story!! They have never wanted the Island to be anything else than what it is now …. a stomping ground for the rich & a place where injustice, stealing and inequality are commonplace and unpunished!! The moral of the story is at the end of this great parade they didn’t receive the flag, they got the pole. PNP fooled them again. Now the PNP can make a huge celebration of the incoming $72 billion dollar Vulture Hedge Fund, and wave the pole. Despierta Boricua. Osea q Los Puertorriqueños quieren ser I don GRINGOS ?…. “It’s a Tug of war “…. Divide y conquistaras y reinaras.